Functional Fashion. 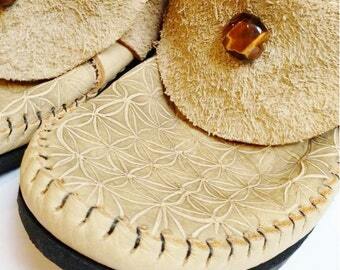 Our products are hand-made by a small team of dedicated leather artisans in Eugene, Oregon, USA. Everything is hand built with longevity in mind, taking care to make useful, durable, and beautiful products that last. 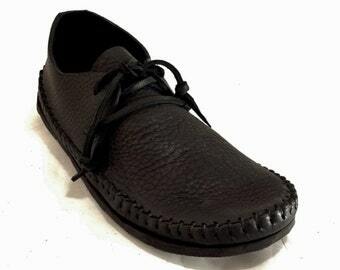 Our Vibram and leather soles can be replaced for $50-$75. Like any shoe, the amount of wear and the terrain you're walking on determines the life of your sole. Be kind to your moccasins and they will be kind to you. If you need your item by a certain date, please inquire about current turnaround time before purchasing and we will do our best to accommodate your request. INTERNATIONAL BUYERS: Please be aware that your country may charge an import fee. You may be required to pay this fee upon receiving your package at your local post office. All orders are shipped with a free shipping confirmation number. If you'd like to purchase insurance, please let us know. We are not responsible for lost or stolen packages. This is probably the nicest purse I have ever owned!!! 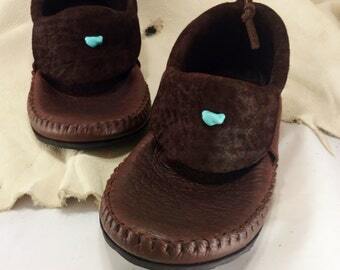 Adorable and perfect size for brief sylvan outings! I spent $350 on a size 7. They arrived, in a Tyvek mailer, with NO card, and NO care info, AND they looked too small and proved to be way too tight and short. ALSO, each sole was marked with a number 6. ??? When I tried repeatedly to explain their mistake, I was told that a 6 indicated to them that the boot was a 7!!! SERIOUSLY? I returned them and was charged a $50 restock fee, and was told that they might have a hard time reselling that size. 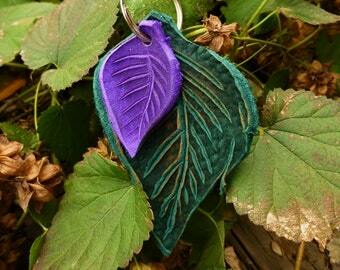 Buy your leather leaves and trinkets here, but NOT anything expensive. Spotty communication and excuses crafting their image from a cul-de-sac in suburbia. Not cool. WTF!!! Isn't everyone tired of wearing disposable, uncomfortable, low quality, imported footwear ? So was Manna. That's why in 2000, she started stitching away, creating her own line of footwear made right here in the United States. 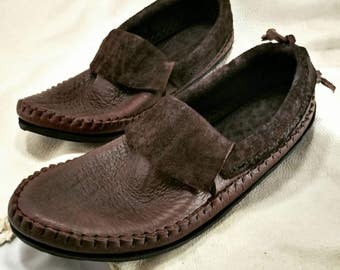 The bull hide used to create Tread Light moccasins are sourced from Colorado and Wyoming where the state law dating back to the 1800's is "range free", meaning if you Don't want livestock on your land, you put up a fence! The tannery we work with is family owned, and located in Wisconsin. 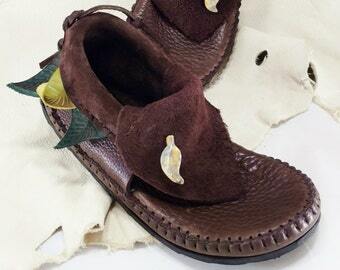 Tread Light moccasins are both Funky and classic! So comfortable, our customers say they are like a hug on your foot! Manna began Tread Light in 2000, and grew her business for over a decade. She is dedicated to her children and building comfortable, durable footwear made with love! If it needs to be done~ he makes it happen! Helper extraordinare! She makes so much happen! Tread Light is a family owned business born in Oregon in 2000 by Manna Reynolds. We build funky, unique footwear for festival goers, as well as simple, comfortable footwear for everyday life. All of our leather and Vibram soles are resoleable! All of our items are 100% exchangeable. In the event of a return we charge a 20% restocking fee. Returns/Exchanges must be sent back to us within 2 weeks of receiving them. We will not issue a refund for sandals or moccasins that have been worn outside. The buyer pays all shipping costs in the event of a return or exchange. Because of direct deposit from our Etsy account, refunds may take 2-3 weeks to process, please be patient. We charge a base shipping fee that includes a free shipping confirmation number. If you would like insurance, signature confirmation etc.. Please let us know, especially if you live in an apartment building or somewhere your mail or packages are not secure. Please be aware that we are not responsible for lost or stolen packages. Turn around time for our leather creations ranges from 1-2 weeks for sandals, bags, purses & accessories, 6-8 weeks for moccasins and boots. If you need your item in time for a certain event please, check the current wait time before you place your order.